The deepening of the regional production and trade network(RPTN) is a critical factor behind the increasing concentration of world textile and apparel exports. RPTN refers to the phenomenon that geographically proximate countries form a regional supply chain. Asia: within this regional supply chain, more economically advanced Asian countries (such asJapan, South Korea, and China) supply textile raw material to the less economically developed countries in the region (such as Bangladesh, Cambodia, and Vietnam). Based on relatively lower wages, the less developed countries typically undertake the most labor-intensive processes of apparel manufacturing and then export finished apparel to major consumption markets around the world. Europe: within this regional supply chain, developed countries in Southern and Western Europe such as Italy, France, and Germany, serve as the primary textile suppliers. Regarding apparel manufacturing in EU, products for the mass markets are typically produced by developing countries in Southern and Eastern Europe such as Poland and Romania, whereas high-end luxury products are mostly produced by Southern and Western European countries such as Italy and France. Furthermore, a high portion of finished apparel is shipped to developed EU members such as UK, Germany, France, and Italy for consumption. Western-Hemisphere(WH): within this regional supply chain, the United States serves as the leading textile supplier, whereas developing countries in North, Central andSouth America (such as Mexico and countries in the Caribbean region) assemble imported textiles from the United States or elsewhere into apparel. The majority of clothing produced in the area is eventually exported to the UnitedStates or Canada for consumption. First, Asian countries are increasingly sourcing textile inputs from within the region. In2017, close to 80 percent of Asian countries’ textile imports came from other Asian countries, up from around 70 percent in the 2000s. Second, the pattern of EU intra-region trade for textile and apparel stays strong and stable. Intra-region trade refers to trade flows between EU members. In 2017, 55 percent of EU countries’ textile imports and 47 percent of EU countries’ apparel imports came from within the EU region. 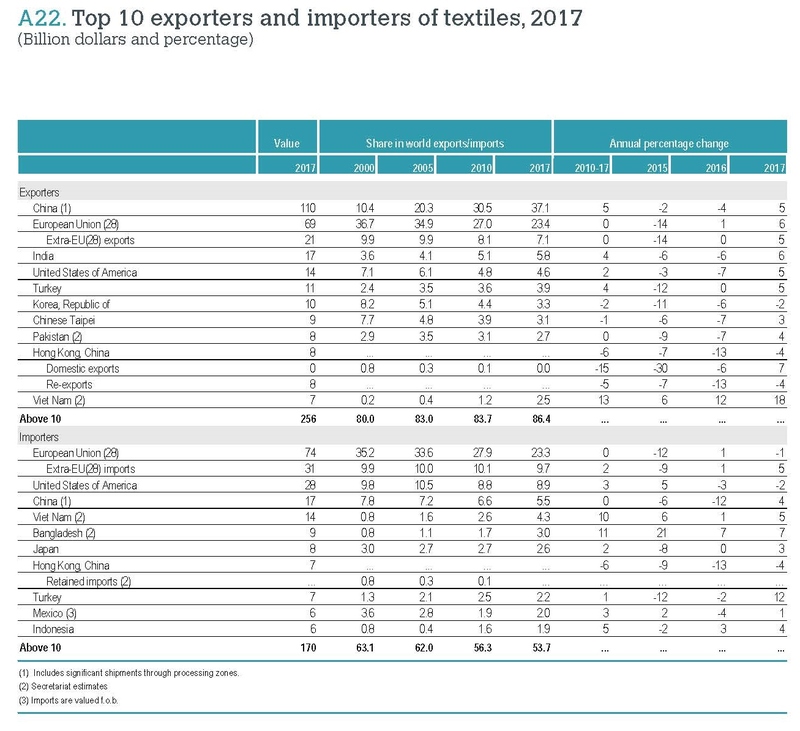 Over the same period, 68 percent of EU countries’ textile exports and 75 percent of their apparel exports also went to other EU countries. Third, trade flows under the Western-Hemisphere textile and apparel supply chain are becoming more unbalanced. On the one hand, textile and apparel exporters in the Western-Hemisphere still rely heavily on the region. In 2017, respectively as much as 80 percent of textiles and 89 percent of apparel exports from countries in the Western Hemisphere went to the same region. However, on the other hand, the operation of the Western-Hemisphere supply chain is facing growing competition from Asian suppliers. For example, in 2017, only 24.8 percent of North, South and Central American countries’ textile imports and 15.7 percent of their apparel imports came from within the region, a record low in the past ten years. 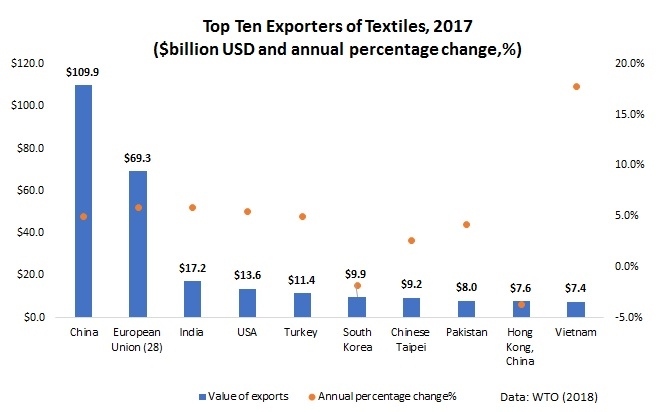 Look ahead, it will be interesting to see how will the reaching and implementation of several new free trade agreements, such as CPTPP, RCEP, EU-Vietnam FTA, and the potential US-EU and US-Japan FTAs, affect the regional pattern of world textile and apparel trade. Why is the used clothing trade such a hot-button issue? 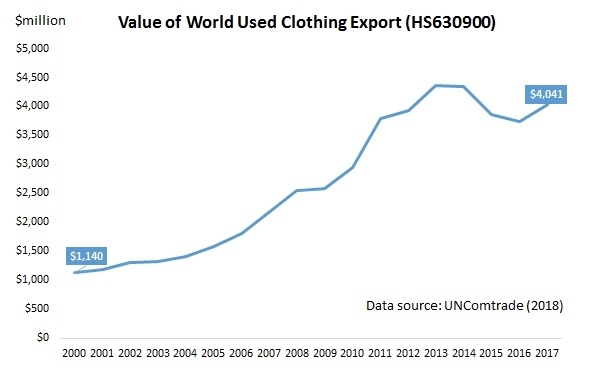 First, the world used clothing trade has grown significantly over the past ten years. Statistics from the United Nations show that the value of world used clothing trade (HS code 630900) has quickly increased from $1.8bn in 2006 to $3.7bn in 2016, an increase of 106 percent. 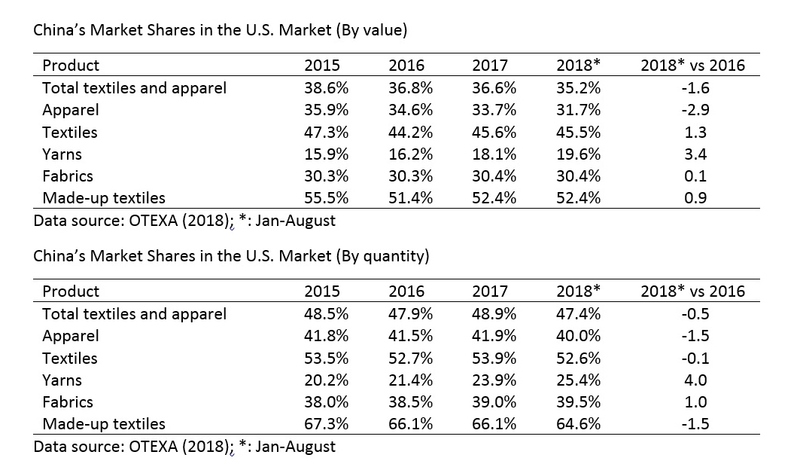 Between 2006 and 2016, the value of world used clothing trade enjoyed a 7.6 percent compound annual growth rate (CAGR), which was almost double the pace of 3.4 percent CAGR for new clothing trade (HS chapters 61 and 62) over the same period. Second, the world used clothing trade flow is highly unbalanced. On the one hand, the developed economies are the dominant suppliers of used clothing to the world. In 2016, nearly 40 percent of the world’s used clothing exports came from three countries alone: the United States (15 percent), the United Kingdom (13 percent) and Germany (11 percent). 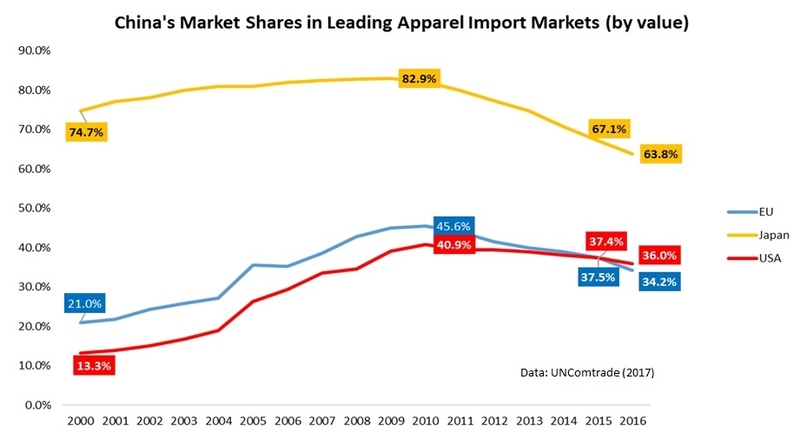 Data also shows that the European Union and the United States together stably accounted for as much as 65 percent of the value of world clothing exports between 2006 and 2016. The other country worth mentioning is China, which is quickly becoming another leading used clothing exporter in the world. In 2016, China’s used clothing exports totaled US$218m from only US$0.32m in 2006, an increase of more than 684 percent! On the other hand, most of the world used clothing exports end up sold in the developing countries, especially the least developed ones. For example, in 2016, Sub-Saharan Africa (SSA) as a whole imported approximately 20 percent of the world’s used clothing, far more than any other regions in the world. 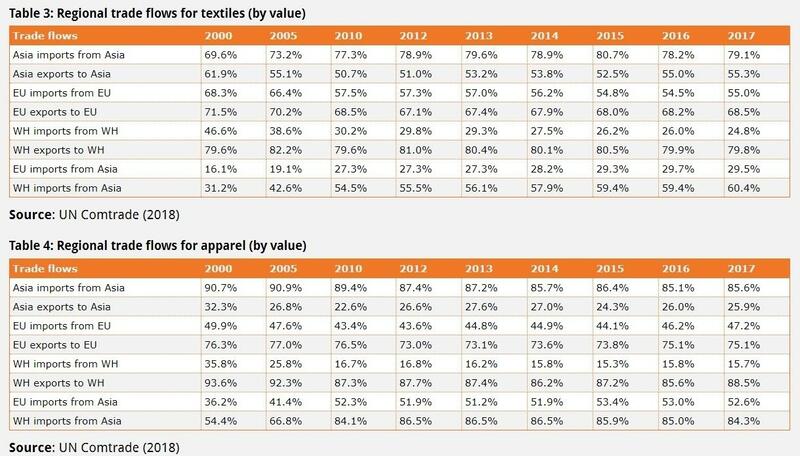 By value, the top three individual importers of used clothing in 2016 are all developing countries as well, namely Pakistan (6.0 percent), Malaysia (5.8 percent) and Ukraine (4.9 percent). Third, trade policies regulating used clothing trade often raise controversies. 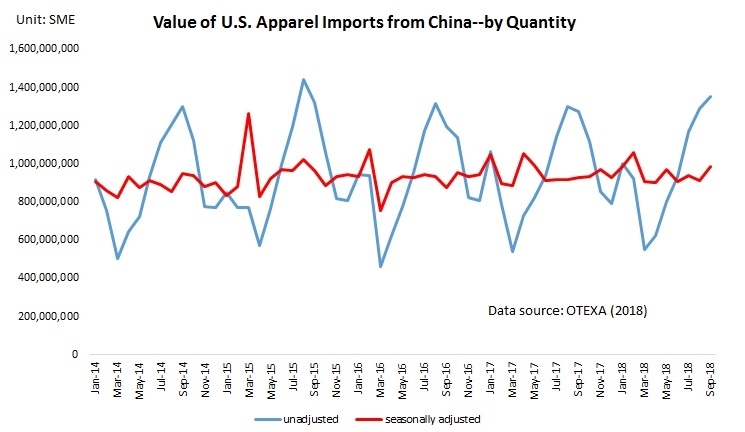 While trade barriers on new clothing attract much of the public attention, the used clothing trade is facing even heavier and trickier restrictions of various kinds. 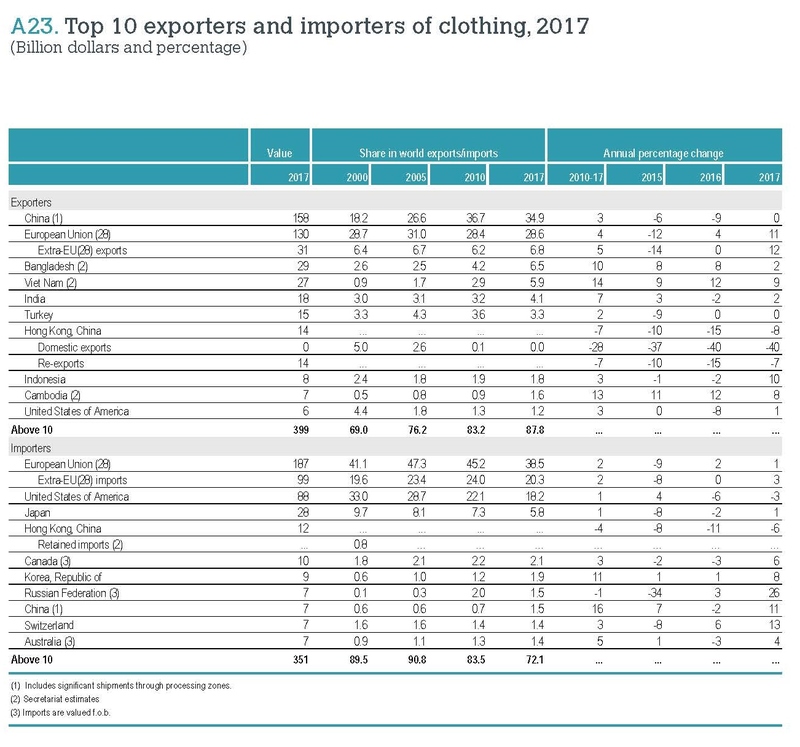 The World Trade Organization (WTO) data shows that in 2016 the average applied tariff rate for used clothing imports was 19.3 percent, higher than 15.4 percent of new clothing (HS Chapters 61 and 62). Of the total 180 countries covered by the WTO tariff database, 115 (or 64 percent) set an equal or higher tariff rate for used clothing than the new one. 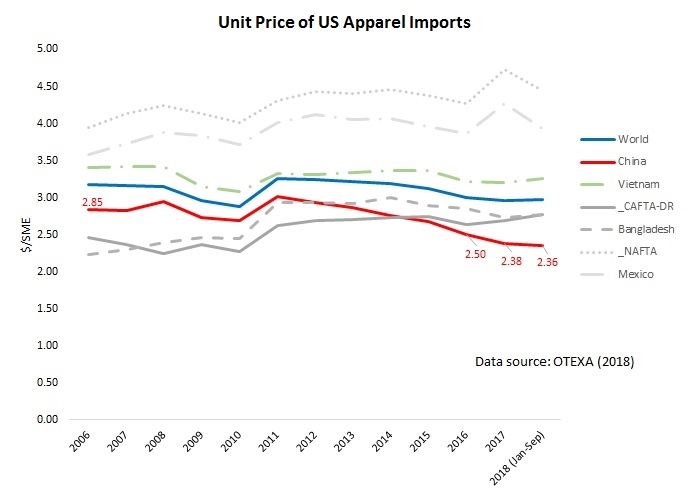 Further, it is not rare to see extremely high import tariff rates and other quantitative restrictions applied to used clothing trade. For example, in 2016 the applied most-favored-nation (MFN) ad valorem equivalent tariff rate for used clothing was as high as 356.9 percent in Uzbekistan, 167.3 percent in Zimbabwe, 149.2 percent in South Africa, 116.8 percent in Rwanda and 100 percent in Vietnam. After all, because of the complicated social, economic and political factors involved, how to regulate and manage used clothing trade remains a key challenge facing the world community. Author Sheng LuPosted on November 15, 2018 November 15, 2018 Categories International Trade, Original ResearchTags AGOA, trade policy, used clothing23 Comments on Why is the used clothing trade such a hot-button issue? Following the steps of many countries in history, China is gradually shifting its role in the world textile and apparel supply chain. While China unshakably remains the world’s largest apparel exporter, its market shares measured by value fell from 38.6 percent in 2015 to 33.7 percent in 2017. 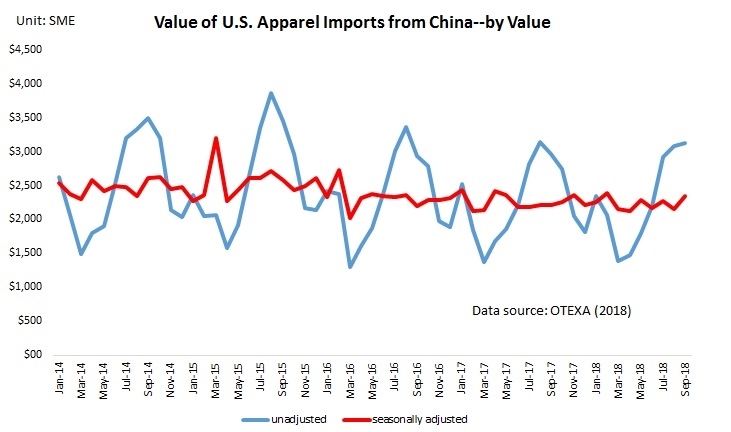 China’s market shares in the world’s top three largest apparel import markets, namely the United States, EU, and Japan, also indicate a clear downward trend in the past five years. 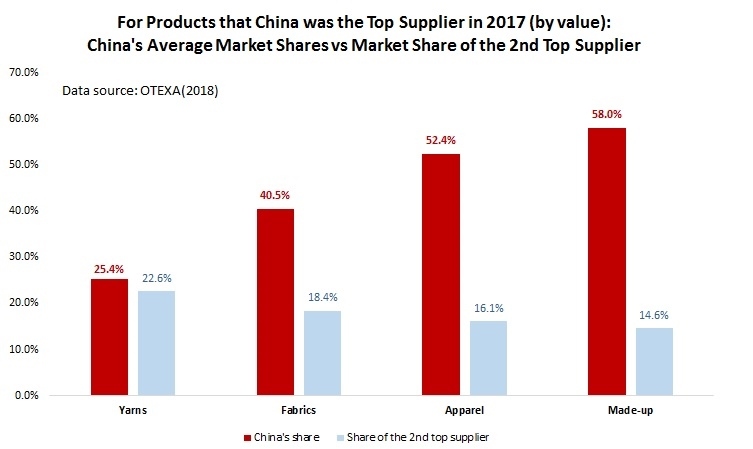 This result is consistent with several recent survey studies, which find that fashion brands and retailers are actively seeking alternative apparel sourcing bases to China. Indeed, no country, including China, can forever keep its comparative advantage in making labor-intensive garments when its economy becomes more industrialized and advanced. 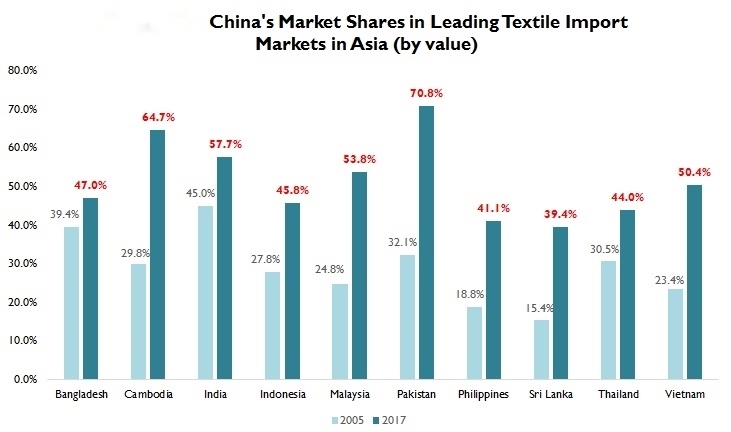 However, it is also important to recognize that China is playing an increasingly important role as a textile supplier for apparel-exporting countries in Asia. 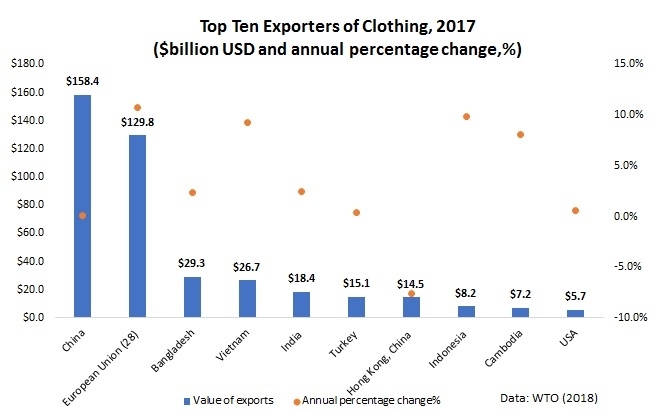 For example, measured by value, 47 percent of Bangladesh’s textile imports came from China in 2017, up from 39 percent in 2005. We observe similar trends in Cambodia (up from 30 percent to 65 percent), Vietnam (up from 23 percent to 50 percent), Pakistan (up from 32 percent to 71 percent), Malaysia (up from 25 percent to 54 percent), Indonesia (up from 28 percent to 46 percent), Philippines (up from 19 percent to 41 percent) and Sri Lanka (up from 15 percent to 39 percent) over the same time frame. So maybe the right question to ask in the future is: how much value of “Made in China” actually contains in Asian countries’ apparel exports to the world? Are Textile and Apparel “Made in China” Losing Competitiveness in the U.S. Market?